500px app for iOS is an online platform for photographers to share their work and be inspired by their peers. Today it received an update which allow you to upload iPhone shots directly from the application. 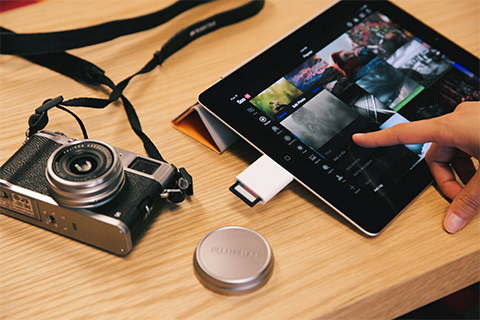 All you need to share DSLR pictures without a PC are an iPad and its SD-card reader. – Stay up to date on your friends’ activity using our innovative Flow timeline. – Every time a photo is liked, favorited, or commented on by someone you follow, it’ll show up in Flow. Check back often to see what your friends are up to! – Explore the Popular, Editors’ Choice, Upcoming and Fresh feeds, as well as other feeds of amazing photography with the swipe of a finger. – When photos are uploaded to 500px, they start out in Fresh. As a photo receives more attention, our magical Pulse algorithm might bubble it up to Upcoming, and if you’re lucky, our coveted Popular gallery! – Photos in Editors’ Choice are hand-selected by our staff, providing a fresh perspective on the fantastic photos in the community. – Tap on any photograph to see it in full-screen mode for an immersive viewing experience. Tap again to display details, comments or other activity on each photograph. – Interact with the community by commenting on photos, liking them, or adding them to your favorites for later viewing. – Learn more about your fellow 500px users by visiting their Profiles. You can see their photos and other 500px activity, as well as their contact info and even which photography gear they use. – Sets! You can now see all the public sets that a user has created, in a beautiful mosaic-like layout. Sets can be found in a user’s profile. Sets are a way to group and present photos together. – Get notified when community members interact with you and your photos; and if one of your photos makes it to Upcoming, Popular, or Editors’ Choice, you’ll be the first to know! – Enjoy amazing photography surrounded by a beautiful interface made for iOS 7 with blur effects, transitions, and other details. We always put the photos first. 500px is available as an universal app ( iPhone and iPad ) on the App Store.